Corinna was raised on her father's estate in England's Lake District. After studying at University in Florence, she traveled the world seeking the perfect outlet for her creative talents. After success as an artist, both in watercolors and her unique three dimensional portraits "Miniature Lifestyles" (click here for more information and photographs), she moved to California. 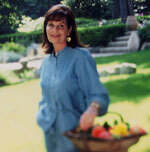 After surviving breast cancer, she became an acclaimed interior designer (see www.corinnagordon.com). Her clients have included Kirk Douglas, Marcus Allen, Dr. Dre, William Randolph Hearst II, Dame Anita Roddick and The Biltmore Salon & Spa, and the $50 million Montecito home that was later purchased by Oprah. She studied goldsmithing at Santa Barbara City College and was passionate about finding antique, high-karat gold beads and amulets, precious gems and unusual stones on her travels. Returning home to Montecito, California she created vibrant, elegant, one-of-a-kind pieces with a unique flair for color and drama. Covering the spectrum from huge stone collars to more delicate and intricate necklaces, bracelets, anklets, armlets and her popular signature double earrings, her work intrigues and delights her international clientele. 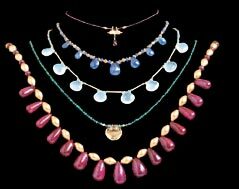 She enjoys commissions for custom designs including brides, celebrities & children. Corinna's jewelry has been featured in international publications such as Vogue, Vogue Japan, Town & Country, Elle Accessories, Distinction, Vivre, People, LA Confidential, Santa Barbara Magazine, Four Seasons Magazine, and she was seen on TV presenting the Winner of "America's Next Top Model" with one of her necklaces. Celebrity fans include Liv Tyler, Nicole Kidman, Marcia Cross, Mary Louise Parker, Evelyn Lauder, Fran Drescher, Olivia Newton-John, Jane Seymour, Cheryl Hines, Leonardo Di Caprio, Elijah Wood, Jamie- Lynn Sigler, Macy Gray, Blu Cantrell, Justine Bateman, Jean Smart, Sir Ben Kingsley, Aida Turturro, Vanessa Hudgens, Niecy Nash, Hugh Dancy, Jeri Ryan, Allison Janney, Finola Hughes, Amanda Detmer, Sharon Lawrence, Jennifer Tilly, Ileana Douglas, Julie Benz, Hayden Panettiere, Cheri Oteri, Kathy Griffin, Carol Burnett, Dr.Dre’s wife Nicole, Mrs. John Cleese, Mrs. Kirk Douglas, Mrs. Jimmy Buffett, Ruby Wax and many others. Corinna now lives and works in Santa Barbara, California.